It was an amazing day for the first trail race of the year on Sunday! The North Face Dirty Feet Trail Race #1 took place in the beautiful grasslands of Kamloops and I was pumped to get going! Anyway! After I got checked in I had quite a bit of time to kill before the 5K runners departed. We cheered on the half-marathon runners who came through and I caved and ended up buying a Dirty Feet hat for future runs. I ended up chatting with an acquaintance and I ended up running with him a bit during the race. The views around the 2km mark were ridiculous, let me tell yah! Overall, I felt just “okay” during the race! I definitely didn’t train enough for hills and got a little too ambitious off the start; I ended up powering out a little after the first kilometre and had to dial things back a bit, but I managed okay! There was definitely zero gas left in the tank when I finished, haha. My official time was clocked at 31:58, so I’m pretty content with that, all things considered! I stuck around for door prizes and managed to have my number called, so I chose a pretty awesome shirt, and then it was time to walk hobble up to the bus to get back to my truck. Oh, and an added bonus? Zero ticks hitched a ride on me during the race! Seriously, I was more concerned about ticks than the difficulty of the trail! As always, a huge shout-out to Phil, Grace, and the whole Dirty Feet crew for an awesome race! An intensely beautiful, searingly powerful, tightly constructed novel, Brother explores questions of masculinity, family, race, and identity as they are played out in a Scarborough housing complex during the sweltering heat and simmering violence of the summer of 1991. With shimmering prose and mesmerizing precision, David Chariandy takes us inside the lives of Michael and Francis. They are the sons of Trinidadian immigrants, their father has disappeared and their mother works double, sometimes triple shifts so her boys might fulfill the elusive promise of their adopted home. Coming of age in The Park, a cluster of town houses and leaning concrete towers in the disparaged outskirts of a sprawling city, Michael and Francis battle against the careless prejudices and low expectations that confront them as young men of black and brown ancestry — teachers stream them into general classes; shopkeepers see them only as thieves; and strangers quicken their pace when the brothers are behind them. Always Michael and Francis escape into the cool air of the Rouge Valley, a scar of green wilderness that cuts through their neighbourhood, where they are free to imagine better lives for themselves. Propelled by the pulsing beats and styles of hip hop, Francis, the older of the two brothers, dreams of a future in music. Michael’s dreams are of Aisha, the smartest girl in their high school whose own eyes are firmly set on a life elsewhere. But the bright hopes of all three are violently, irrevocably thwarted by a tragic shooting, and the police crackdown and suffocating suspicion that follow. 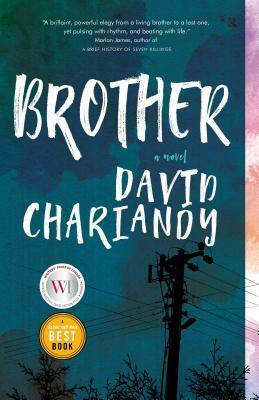 With devastating emotional force David Chariandy, a unique and exciting voice in Canadian literature, crafts a heartbreaking and timely story about the profound love that exists between brothers and the senseless loss of lives cut short with the shot of a gun. This novella received a lot of rave reviews on Goodreads, but I personally wasn’t quite as captivated by it as most other readers were. That’s not to say that I didn’t find the message to be important, it still is and is very relevant to this day. It’s disappointing to know that even though this story takes place in the early 90’s, the issues that society was facing then are still happening now. If anything, Brother is an important read to remember the struggles people face when they don’t quite fit in, even in Canada where we’re hailed as being an all-accepting country. Racism is very much a real thing here. I truly felt for Francis and Michael, with Francis being thrown into becoming the man of the house at such a young age, and Michael still trying to just be a kid but also gain respect amongst his peers. Perhaps the reason though for my lower rating for Brother is because I desperately wanted more. On the other hand, I wonder if Chariandy purposely made this a quick read that had brief subplots to reflect what happens in reality. Not every avenue pans out in real life; there are a lot of situations where “that’s that” and you don’t get to elaborate or know more. Either way, I still think Brothers is a decent quick read.